Life has recently gotten in the way of my thrifting adventures. Therefore I am reaching back into my thrifty archives for today's post. I have a soft spot [no pun intended] for polymer clay. IMHO it is the most amazing medium. A while back I was fascinated by applying it to glasses. To keep my costs low I would scour charity shops for nice stem ware sets to cover with clay. It is very durable, but I only recommend hand washing. Not because the clay isn't tough, it is. But because over time the dish washing detergent will destroy the finish. Detergent is meant to eat off the gunk stuck to your dishes and so in turn will eat the finish off your work. Set of four tiny aperitif/shot glasses with a delft inspired flower cane. These sold recently at the artist gallery where I have pieces for sale. Set of four red wine goblets with a 'giraffe' inspired cane pattern. Available on both Etsy & Art Fire. 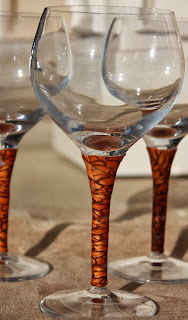 By the way, one of my most viewed items.... and are even part of my blog header. Just a little aside, here is a custom order I did a few months ago for a bridal shower. 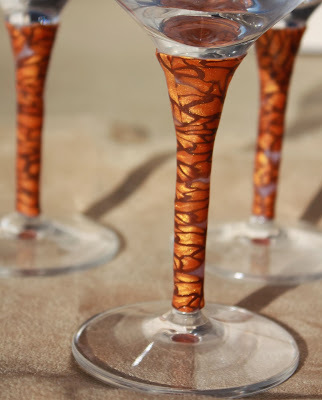 The giraffe patterned wine goblets are spectaular! These are too cute. I guess you bake the clay onto the glasses after you cover them? Cool idea. Tammie, thank you for the show and tell! I just saw a blog post recently that showed polymer clay used in different ways other than jewelry. 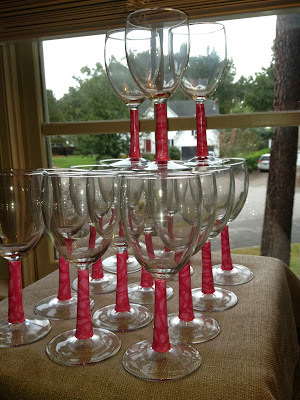 Your wine goblets are really amazing and look like a lot of fun to use!